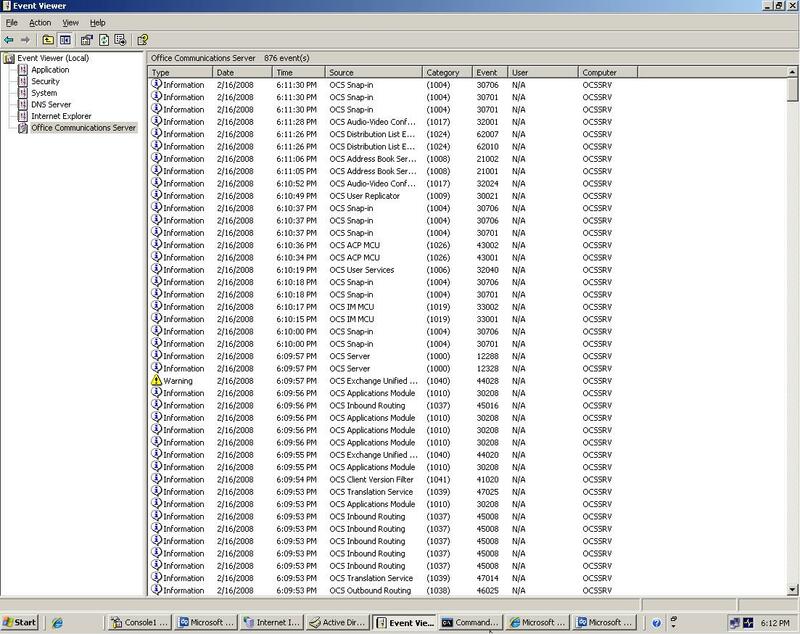 A while ago I wrote about virtualization of Office Communication Server 2007 R2, OCS 2007 R2 had a limited supportability for virtualization” Only the Presence, IM (including remote access, federation, and PIC) and Group Chat workloads”. The next release of Office Communications Server and Communicator together with Exchange 2010 is currently referred to as UC “Wave 14″ (code-name). The latest publicly available release date is in “late 2010”. Today I got this mail from Omar El Sherif Microsoft TSP. this is some amazing news for all virtualization fans. finally the OCS will go virtual. “We are pleased to announce that the Office Communications Group will soon release the virtualization story of Office Communications Server 2007 R2. With this type of server deployment, we will support both a fully distributed virtualized topology across several hypervisors and a single server virtualized topology. This will include ability to deploy those topologies onto Windows Server 2008 Hyper-V, or onto any Server Virtualization Validation Program (SVVP) certified partners (http://www.windowsservercatalog.com/svvp.aspx?svvppage=svvp.htm). Note that there are some limitations to this support. Only the Presence, IM (including remote access, federation, and PIC) and Group Chat workloads will be supported. The following server roles can be deployed: Consolidated Front-End Servers, Back-End SQL Server 2008 64 bits, Group Chat Channel Servers, Group Chat Compliance Servers and Edge Access Servers. Those virtual machines will be running on Windows Server 2008 64 bits. The topology has been tested to handle up to 40,000 users, including 10,000 group chat users. All other workloads will not be supported as part of this announcement. That means voice, video, live meeting and application sharing workloads will not be part of the architecture, even for P2P communications. Therefore audio/video/web conferencing servers, audio/video/web edge conferencing servers, dial-in conferencing, archiving/monitoring server, Communicator Web Access, enterprise voice, or Remote Call Control will not be deployed as part of the “virtualized” pool. When these workloads are required, then a new pool with physical servers should be deployed for those users. In order to help customers scope their topologies, the product group will also release Microsoft® Office Communications Server 2007 R2 Capacity Planning Tool, capable of simulating user load for the available workloads. This will help customer to quickly validate the hypervisor load and scalability before going to production. Link.Net Its official! You are now Voice Ready for Microsoft Office Communicator. We are also officially now part of highest UC technical program, Microsoft Technical Adoption Program (TAP). I have to really thank two of our great team members who have been working really hard on that to pass Microsoft requirements and deadlines , Thanks to Mina Nagy our UC team lead for outstanding effort and the great work he did and thanks to Caroline Ramzy who has shown great troubleshooting skills in solving all problems we faced. This post based on Mina Nagy E-mail. OCS Failed during Forest Prep. OCS Server Failed during forest Prepration although the domain prep worked fine.Reading the logs doesn’t turn up anything obvious in terms of what fields are not available. Failure [0xC3EC78CA] At least one built-in display specifier object could not be found. Please make sure all display specifier objects were created successfully during DcPromo process by checking log files (%Windir%\Debug\Dcpromohelp.log and %Windir%\Debug\Csv.log). Realizing that Prep Forest adds the required OCS containers, you may have a write error or you could have problems with your AD schema. This issue may occur if the Display Identifiers object cannot be located in Active Directory. 1-Click Start, click Run, type cmd in the Open box, and then click OK.
* Replace domain distinguished name (DN) in the command with the DN of the domain, such as dc=domain_name,dc=local. After long time of the first release of Office Communication Server 2007 and mystery about X64 Support Microsoft announced that Next release of OCS will support 64 Bit OS (x64). As a part of the broad initiative across Microsoft to support 64 bit versions across many of its product lines, the next release of OCS will support 64-bit operating systems only. This decision will help meet customer demand and is a natural progression of the product that aligns with the same approach taken by the Exchange team (with Exchange 2007) and the SharePoint team (with SharePoint 2007) to support 64 bit operating systems only. For the next release of OCS, Microsoft will support deployments on 64 bit operating systems – Windows Server 2003 x64 (R2) and Windows Server 2008 x64. 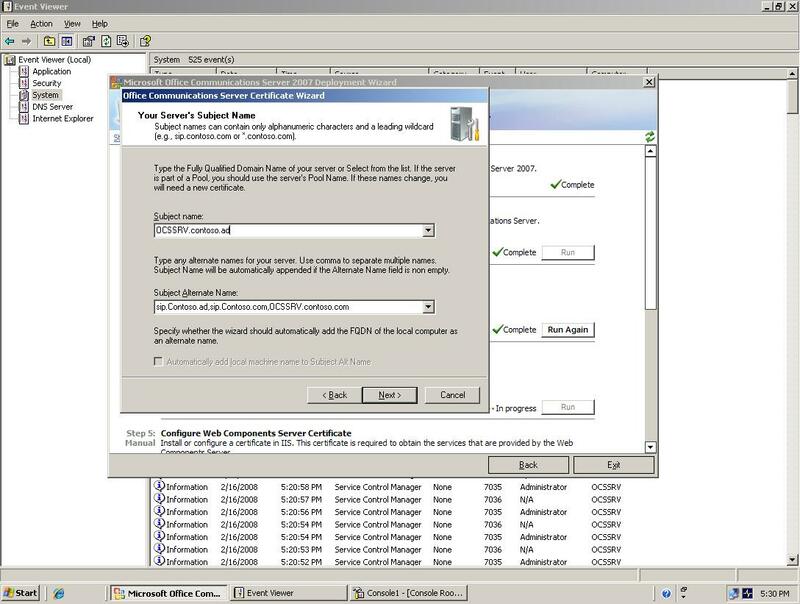 I faced problem in implementation Client Web Access server on windows 2003 R2 SP2. This error on CWA server related to cwsauth.dll file that can’t be loaded. The 64-bit edition of SQL Server™ 2005 SP2 on the Back-End Database of an Enterprise pool or the Archiving and CDR database. Running the 32-bit version of the Access Edge Server on 64-bit hardware with WOW (Windows on Windows) 64 mode on the 64-bit edition of Windows Server 2003 SP1 and later. Running the 64-bit kernel driver component of the A/V Edge Server natively on 64-bit hardware plus the A/V Edge Server service component with WOW64 mode on the 64-bit edition of Windows Server 2003 SP1 and later. Running the 32-bit version of Standard Edition server on 64-bit hardware with WOW64 mode on the 64-bit edition of Windows Server 2003 SP1 and later. Like you see it does not give any answer for my problem.. Actually deploying OCS in X64 bit system is not the best practice since the setup for OCS and the console run under the WOW64 subsystem since they are 32bit programs. Comment : Deploy your OCS server in win X86 mode..It is better. Aside:Actually, I think your situation has a better solution that solve X64 problem. I think it is known issue with application running in IIS in WOW64 mode. If you check your Event Log entries, you will likely find several of the following entry, followed by another entry declaring that the Application Pool is being disabled. Could not load all ISAPI filters for site/service. On 64bit Windows, the “bitness” (i.e. 32bit or 64bit) of a process must match the bitness of the DLLs loaded by that process. In other words, a 64bit EXE can only load 64bit DLLs, and 32bit EXE can only load 32bit DLLs ( the problem of the cwsauth.dll file ). .NET Framework 2 has ASP.Net implemented through 32bit ISAPI DLLs. What is happening when OCS wizard install .NET Framework 2 on IIS6 on 64bit Windows is that while IIS6 runs W3WP.EXE as 64bit, you are configuring it to load some 32bit ISAPI DLLs. This does not work and leads to the event log entry. Since the ISAPI DLLs are loaded for every request, this failure immediately happens again and again, thus triggering the “Rapid Fail Protection” health monitoring check of IIS6. This leads to this Application Pool being taken offline . *** IMPORTANT *** Then restart the CWA Application Pool that returns the error since it is stopped. You cannot fix any error without restarting the Application Pool. This command switches IIS6 into running WOW64 (i.e. 32bit compatibility) mode on 64bit Windows on-the-fly so that IIS6 can immediately run 32bit ISAPI DLLs… unless that Application Pool is ALREADY returning 503 errors, in which case you MUST restart the Application Pool to have the bitness switch take effect. It makes sense because a 503 error means the Application Pool is offline and not running, so you must restart it to have setting changes take effect. Now, I cannot guarantee that this works for you because you may have other applications that must run as 64bit, in which case you have a conflicting need to simultaneously run 32bit and 64bit code in IIS6, which is not allowed. See KB 895976 for more details. 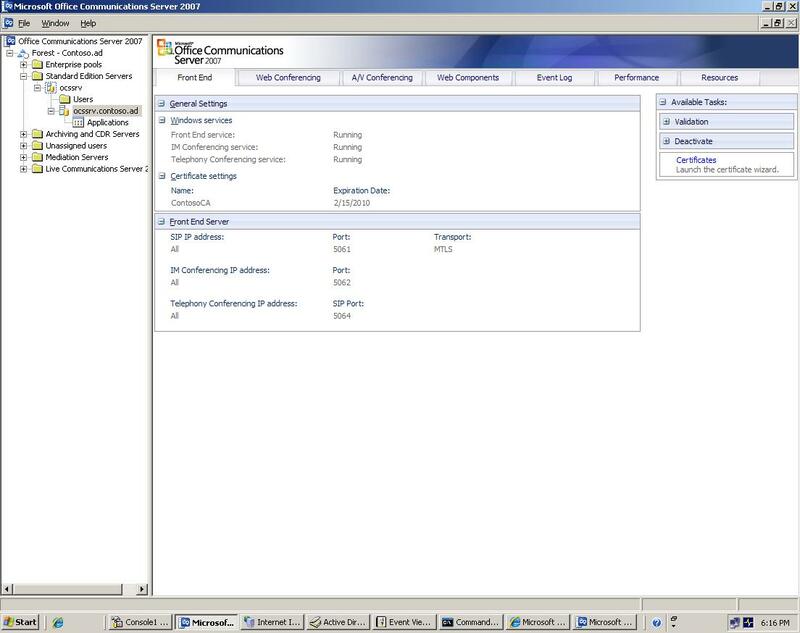 Automatic configuration allows Communicator to find and connect to the appropriate OCS server without manually entering a server name into its settings. Communicator has special requirements for DNS and certificates to make this work properly. The problem that OCS likes other Microsoft UC solutions does not support multiple SIP name. Most of organizations need DNS splitting as security requirement. Here you are the Scenario: We have organization that its internal domain name is Contoso.ad and have E2K3 server with E-mail Policy @contoso.com, they need to implement new OCS server to support internal and external users. Easy, maybe it looks like that…The problem that office communicator is designed to log-on using server within same domain name i.e. the OCS FQDN must be in our case OCSSRV.contoso.ad. Until now, it is okay but the user must log-on with name user@contoso.com so we have to support contoso.com SIP domain. Split DNS configuration is a requirement for automatic configuration. Simply put, split DNS means you have two DNS zones for one domain name. One DNS zone exists on internal DNS servers and provides name resolution only for internal clients. Another DNS zone exists on external DNS servers to service external clients. Split DNS is required so that users can use the same sign-on name in Communicator and have their correct login server resolved inside and outside the network. First, we have to create primary DNS zone in internal domain with name Contoso.com. Create A record in it for OCSSRV server. The following SRV records need to be created. Note that these records must be created in the DNS database of the servers authoritative for the particular zone. To support multiple domains for encrypted communications we require that all front-ends in the Pool be configured with a certificate. The certificate must match the FQDN returned by any DNS SRV query. Therefore, the certificate must contain multiple entries. We call these SANs (Subject Alternate Name) and the certificate must include the FQDN of the pool and one entry for each supported SIP domain. I tried to do that through the OCS certificate configuration wizard …It should work. but if it failed you can do it through another way. When you submit a certificate request to an enterprise CA, the certificate template must be configured to use the SAN in the request instead of using information from the Active Directory directory service. In Internet Explorer, connect to http://contoso.ad/certsrv. Click Create and submit a request to this CA. In the Certificate Template list, click Web Server. Provide identifying information as required. In the Name box, type the fully qualified domain name of the OCS server. Under Advanced Options, set the request format to CMC. Multiple DNS names are separated by an ampersand (&). If you see the Certificate Issued Web page, click Install this Certificate. Choose to assign existing certificate and choose OCSSRV.contoso.ad server authentication certificate. 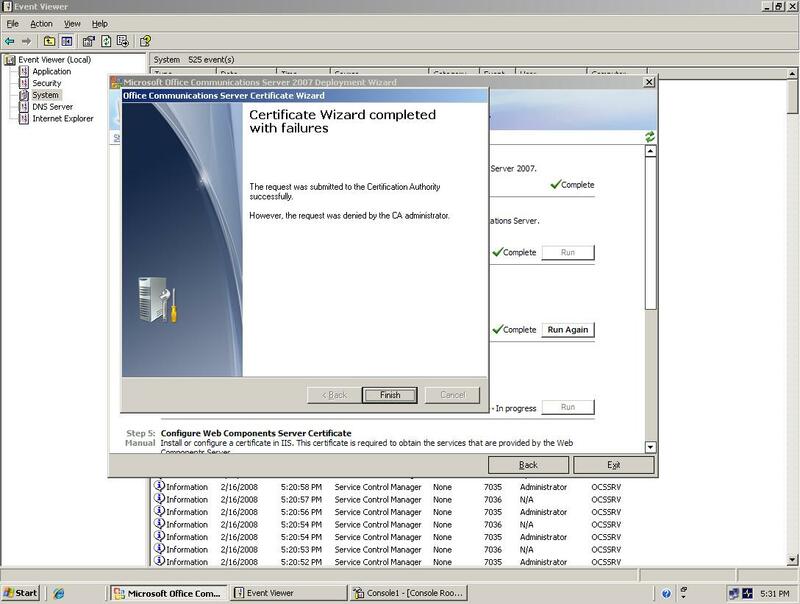 Assign the certificate in the IIS and restart it. Now you can sign in with user@contoso.com although your pool is OCSSRV.contoso.ad.